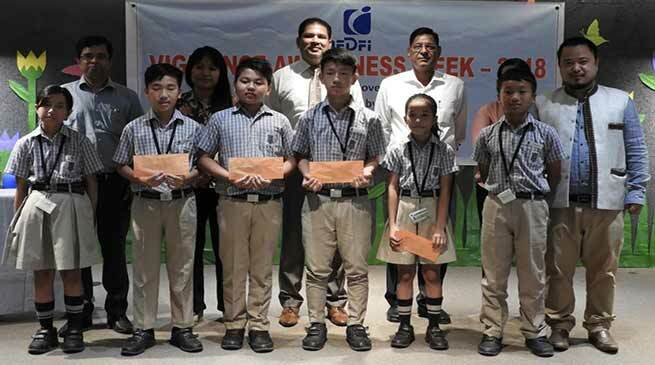 With the rest of the country, HIM International school at Itanagar also observes ” Vigilance Awareness Week”. On the occasion a debate competition was organised in Him International School, with the collaboration of NEDFI. The topic was “ Corruption free India – A Responsibility Solely of the Government. Three students were chosen to speak for the motion and three against it. All the participants spoke confidently and impressed the audience. This was a pleasant surprise to the organisers. The winner, Gumsang Dodum, received a cash prize of Rs. 2000. The runner-up, Tana Dopum, was felicitated with a cash prize Rs.1500. Mizon Jilen, standing third was given Rs.1000. Joram Mercy, a student of grade VI, received the consolation prize of Rs.500. An inspiring speech was given by Mr.S.K.Yadav and Mr. Alen Nabam respectively. The efforts put in by the students, were well appreciated by everyone and more and more students were encouraged to take up public speaking in order to boost their confidence and have a well-rounded personality. Mr. Alen Nabam – the Branch Manager of NEDFI, Mr. S.K. Yadav – Mentor and Ms. Minu Gamlin – the Assistant Manager graced the occasion to encourage the budding elocutors. The Principal – Mr. Manish Mangal and the Vice Principal – Mr. Dubey received the guests and extended a warm welcome to them. It must be mention here that “As part of its efforts to promote probity in public life and to achieve a corruption-free society, the Central Vigilance Commission (CVC) observes Vigilance Awareness Week every year”.